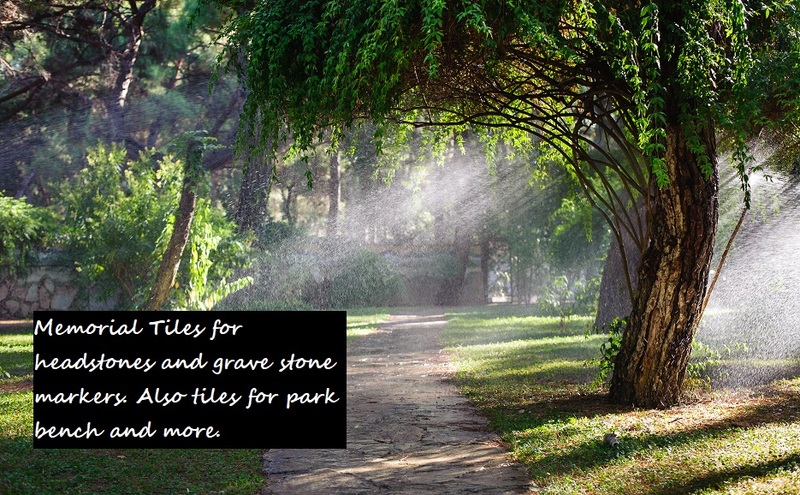 Call 1 855 410 8797 or 416 410 8797 – Specialize in printing outdoor memorial tiles for the cemetery industry. Specialize in printing outdoor memorial tiles for the cemetery industry. We sell to both the retail customer (you need a memorial tile for your relative) and also have bulk pricing or wholesale pricing for the cemetery and the funeral industry. Our print is not like others you’ve seen out there that fade, which is done by the inferior “dye-sublimation” method. Have you ever seen a tile on a head-stone and its image is fading/wearing? That’s dye-sublimation and most of the tile out there were done with this cheaper method, that prints on top of the tile. That’s why it comes off, because its ‘on’ the glaze not under it. We print under the glaze and its permanent print. Our print isn’t ‘on’ but rather ‘IN’ the tile! So, it will not scratch off and we give a 100 year warranty on our durability and put that right on your invoice! There are a few options you have, right off the bat. Is the actual memorial tile, used primarily on head stones. This tile is custom created in Italy for the cemetery industry. These tiles are very thin, thus can go on the head stones that are flat on the ground as well as the more typical ones that stand up–right. They come in a variety of sizes and are approved for the industry. These have smooth beveled edges. and come with the special tape used for install. Not need looking around or mixing mortar – this comes ready to apply and use. The other option is outdoor tile. We can print tiles that are standard outdoor tile. These tiles are not so thin like the Italian Actual Memorial Tiles, these are 3/8 thick and DO NOT have a beveled edging either. So, why do we offer them? They can be cut to variety sizes, they can be used in places like a park-bench or laid by the plot. These can be cut to sizes under 11 x 17 (any combination smaller than that) and of course being “outdoor tile” they are less costly. Custom Tile For Benches or For Laying In Ground by Plot or For Cementing On a Rock as a reminder or for a pet burial in your backyard. Some may ask, “Why can’t I just use the less expensive outdoor printed tile and customize it the way I want and put that on a head stone? Well it would jut out a lot more being thicker, and most North American and European cemeteries do not allow for this thicker tile on the actual head stone. Other countries don’t seem to mind if you use it – just make sure, because once we print your tile, its permanent and we can’t undo it. If you are overseas, we can ship to you its usually $80 to $120 in shipping and it goes by air mail 8 to 12 days on average. We take bank wire transfer and do all the paperwork through email – you can call us but you don’t have to! If you want a memorial plate, or printed plates in general see more of our printed photo plates. www.ParisGroup.ca is our main corporate site.